Settle into this simple rural escape that the owner calls "a humble piece of heaven". Located 45 minutes south of the 401 in a quiet corner of the County, River & Falls is an easy walk to the village of Milford; a short drive (or canoe!) to the Black River Cheese factory, about 10 minutes into the town of Picton and 15 minutes to Waupoos Marina. Close to amenities, yet completely private, River & Falls offers a well-maintained landscape with cut grass paths and lawns, a large deck, hammocks, outdoor games and direct access to Black River. Launch a canoe off the dock or watch for shooting stars at night. Leave the swimming to the turtles and the swans, unless you like to paddle around in wetlands. A naturalist's paradise, 12 acres plays host to several eco-systems including the 60’ Jackson’s Falls waterfall in spring; a narrow creek draining the falls into the river; bullrush wetlands; forest with old growth trees; open meadow in the apple orchard and well-maintained rural lawns with acres of pathways around the whole property. The opportunity to discover different types of flora and fauna set in an accessible landscape makes the outdoor experience of this property unique and complex. The cabin is 3 bedroom, 1 bath (plus outdoor shower), offering views in three directions to the Black River. 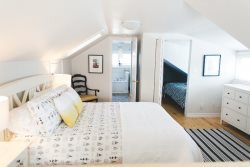 All rooms enjoy skylights: 1 has a double bed, 1 has a queen loft bed and 1 with bunk bed plus a single bed for a total sleeping capacity of 7. There are fans in each of the bedrooms. Each bed has a cotton fibre duvet & pillows for guests to cover with their own bed linen. Please bring extra sheets to cover duvets if you do not own duvet covers. The property has a 4 piece bathroom with claw foot tub and shower as well as an outdoor shower near the house. The kitchen is simple and open with high quality materials throughout. Stainless steel counter top with large sink, hand made solid pine shelves, custom solid cherry counter top bar with stools overlooking the southern lawn. A square butcher block expands the storage options. There is a large screened in Dining room with a 20' long solid ash board table overlooking Black River. Appliances include a 2 burner European electric stove, Panasonic convection and microwave oven and Smeg stainless interior dishwasher. Pots are high quality stainless and there are Creuset baking dishes, muffin trays and more. There is also a propane BBQ and cooler for picnics. Greet the sunrise while sitting on the deck, or better still on the dock. Enjoy breakfast on the deck, west lawn or in the lavender garden in the early morning sun. Lunch is best set up outside on the deck under the canvas umbrella. If the table is oriented on an angle 6 people can sit at the table in some shade. Seats 8 maximum. Alternatively pack a picnic and canoe down to The Black River Cheese factory where you can enjoy ice cream for dessert, a shop at Vicki's Veggies farm stand or go further to South Bay beaches. Undertake a 30-45 mins canoe ride down the river to the outlet onto Lake Ontario. Spot the resident family of swans, Osprey birds diving for fish, Herons, sometimes a Bald Eagle, flocks of Red-Winged blackbirds, little painted turtles, dragonflies-a-plenty and more. Back at the cottage it's time for a cup of tea and a nap or enjoy lounging in hammocks or on the deck. Other afternoon activities include a trip by car to Sandbanks Dunes (25 minutes), Little Bluff conservation area (20 minutes) or the Point Traverse Conservation Area (35 mins), further south and east in the County. Boogie boards, inflatable floaters, wind breaks and beach sun umbrellas are all available for guest use. Evening drinks on the deck allow you to see the sun start to set in the west. See the full sunset without driving anywhere by walking up Jackson’s Lane where you watch the birds race about catching their dinner in the last rays of the day. Dinner is generally savoured in the screened-in porch. Sit at the 20’ long solid ash table with plenty of room for games and dinner at the same time. At twilight glimpse your first fire flies, which only become more numerous as it gets darker. After dark walk down to the dock to see the full night sky. Catch a shooting star here or through the skylight back in your bedroom as you fall asleep. THERE IS NO INTERNET AT THIS PROPERTY. BUT 3G RECEPTION FOR TELUS AND ROGERS IS DECENT. Please ASK about bringing a dog. Provide the breed. A pet cleaning fee of $50 will apply for 2 and 3 night stays. Pet cleaning fee of $100 for a week. Thank you again for opening your cottage to us. Best year yet!! Discovered new places and had a fantastic weekend. Christie, Karen, Max and Bo. Quick to respond to emails and helpful. Beautiful, well cared for property. Perfect for nature lovers. Nice location with the river and the falls. Nice yard, excellent setup for family vacation. Dear Brenda, Thank you so much for letting us enjoy your beautiful cabin in the woods. The property is gorgeous and we had a wonderful time exploring the falls & beaches - especially the sunsets :) Tons of amazing memories were made here this weekend! Thank you for letting us stay at your beautiful wooded cottage for the week. It made William's birthday celebration extra special! The fall colours, the range of weather patterns, and the beautiful accommodations made our stay. We toured the wineries, bought some beautiful selections and feasted each day on local fare. The county is magical and your particular piece of property was the highlight for us to enjoy each day. We saw a range of birds down by the Falls and we canoed several days up and down the river. The kitchen is amazing. I love to cook, and I took the opportunity each day to feast on the local treats. The beautiful relaxing peace and quiet of this place is something one does not often experience. We loved the solitude and the serenity. We return home very well relaxed and rejuvenated from this peaceful and delicious adventure. You truly have a little piece of heaven here. Thanks so much for sharing it with us. Just wanted to say how much we loved the place. We were totally thrilled with the cottage. It's our favorite so far and we have been coming to PEC for years. We will definitely be back. Water is bacteriologically safe, but owners drink spring water. Water cooler (room temp) with 18 liters of Spring Water provided for guest use. Additional water must be purchased. The falls are active in the Spring; not in Summer or Fall. River is not swimmable, however, there is a floating dock suitable to launch a canoe and depending on the water level, a motor boat through July and sometimes into August before the weeds take over. The river is quite weedy however the rich bird and dragonfly life seem to keep the mosquitoes down to the woods and as the sun is setting and in the evening. Mosquitoes are a reality in Ontario, however the position of this property means there is almost always a breeze up the river valley which blows them away in the open. Breezes also keep the house cool in the summer. Please ASK about bringing a pet. A pet cleaning fee of $50 for short stays (2-3 nights) and $100 for longer stays (up to 7 nights) will apply (upon owner confirmation). Canoes and Kayaks for rent via Owner. Guests will be provided her contact info within 4 weeks of arrival and may arrange directly with her. 3-minute drive to swimming in the Milford mill pond, the playground at Mount Tabor Theater, Milford convenience store and The Milford Bistro.